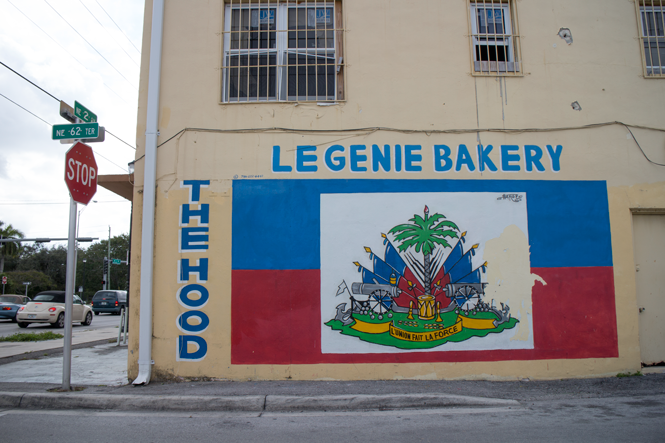 Artist Serge Toussaint painted the Piman Bouk bakery in Little Haiti. His utilitarian murals have decorated the neighborhood since the '90s. Serge Toussaint's Piman Bouk bakery mural. Piman Bouk bakery in detail. St. Michel Super Botanica and Variety Store painted by Serge Toussaint in Little Haiti. Full mural at the St. Michel botanica by Serge Toussaint. Serge Toussaint's signature on his St. Michel mural. Serge Toussaint paints a mural tribute in Little Haiti to Haitian freedom fighters. A memorial mural by Serge Toussaint on Northwest 79th Street in Miami. A sign in Little Haiti. St. Marc's 99c Store in Little Haiti. Mural outside of Deja Vu Decor modern furniture store in Little Haiti. Listen to an interview with Little Haiti's muralist Serge Toussaint. Bortan Fabrics was the first storefront Serge Toussaint painted in Miami. Serge Toussaint is responsible for most of the street art in Little Haiti. His storefront murals signal barbershops, convenience stores, botanicas and even adorn the big Roman Catholic church in the neighborhood, Notre Dame D'Haiti. They're unlike the contemporary murals of Wynwood, which can be edgier, more abstract or in the style of old-school graffiti. Toussaint says most of his murals serve three purposes: to inform possible customers of what a business offers, to beautify the neighborhood, and to keep Haitian heritage alive. "I'm an artist -- a Haitian artist," he says. "I could paint any other thing, but I want people to come from out of states -- when they come to Little Haiti, when they walk up in here, they have a sense of, 'I am in a Haitian community'." Serge Toussaint's works serve as advertisement and art. Haiti inspires Toussaint's work: the week before Art Basel he was working on a mural of the country's forefathers. He said the piece meant a lot to him. "I'm putting it together just to let people know that Little Haiti gonna stay Little Haiti," he said. "Those the ancestors, the ones that really fought for the freedom of Haiti." It's a 40-foot wall off Northwest 54th Street, a main road in the neighborhood. Toussaint says the building is an upcoming clothing store that will sell Haitian-inspired clothing. So the mural is a tribute to the country's ancestors -- but it's also an ad for the future business. Serge Toussaint paints a mural tribute to Haitian freedom fighters. Toussaint makes his living off this style of utilitarian art. But he stresses that his work "always has a message," and believes his mission is to represent the people of Little Haiti, with his paintbrush, on the walls of their community. 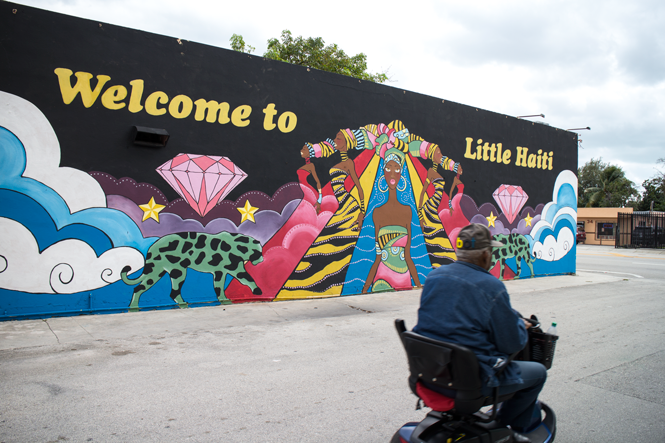 Murals come and go, and Toussaint understands that ("if someone else rent the building, you gotta accept that, they're gonna have to take it down"), but he says "Wynwood" artists creeping into Little Haiti should respect the neighborhood's artistic identity. "I don't have any problem with all the artists," he says, "but if you come into my community... you have to mingle your artwork with something that's related to Haitians." That's happened in some cases. But the tradition of painting storefronts is not typically considered when looking at South Florida's street-art landscape. 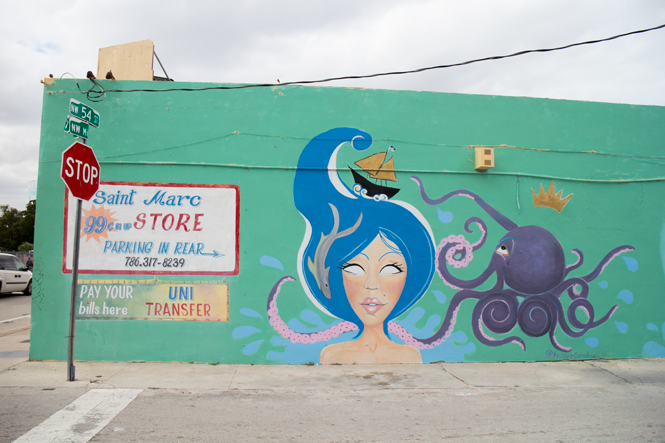 Toussaint is Little Haiti's most prolific storefront muralist, but not the only one. A drive down 62nd or 54th streets is a showcase of local painters' shop designs. But as real estate changes hands and businesses close, most of the works go undocumented. As long as shop owners keep demanding his services, Serge Toussaint will keep painting Haitian heritage. But increasingly, his works might stand alongside that of muralists' whose work is consistently seen as art, not advertisement. 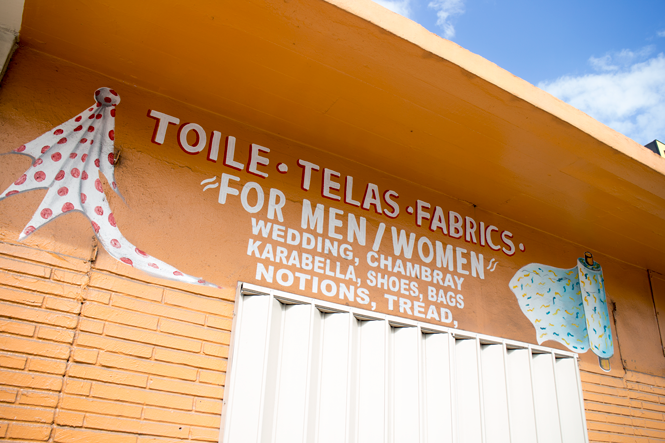 A traditional store sign in Little Haiti shares a wall with a contemporary mural. This story goes along with WLRN's #WhatIsArt project. During Miami Art Week, we ask you to look critically at everything around you -- inside galleries or out. Is it art? What is art? Tweet us. An international, but temporary, art installation is taking shape on the shore of Key West. The International Sand Art competition winds up Saturday, with judging scheduled for the afternoon. Richard Blanco's poem for President Obama's second inauguration, "One Today," just came out as a children's book, with illustrations by Captain Underpants creator Dav Pilkey (Little, Brown Books for Young Readers). Blanco is a poet and a civil engineer and says in the right brain/left brain equation, he uses both sides in equal measure. He recently spent some time with us talking about his own childhood. Turkish Airlines unveiled its successful attempt to break the world record for tallest sand castle Monday at Historic Virginia Key Beach. The event was intended to promote the start of Turkish Airlines’ direct flight service from Miami to Istanbul, which began Sunday.